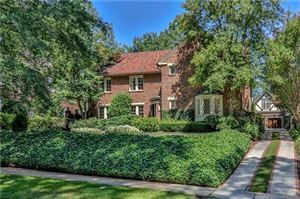 Eastover is another close-in neighborhood in Charlotte that was, and is, home to many of the city's economically and socially prominent families. Southeast of the center city and across Providence Road from Myers Park, Eastover is almost entirely residential. Original homes in Eastover were largely red brick and Georgian Revival architecture. It does have church and school (Eastover Elementary) locations, and is walkable to some shops and restaurants. Also located in Eastover is the Mint Museum. This museum has collections of art from Europe, Africa and the ancient Americas and, an impressive ceramics gallery. The building was once a branch of the United States Mint, when Charlotte was the major gold producing area in the US in the 1790's.